These videos showcase your offers in a proven video formula. You can use them on your website, Facebook and in Ad Campaigns. 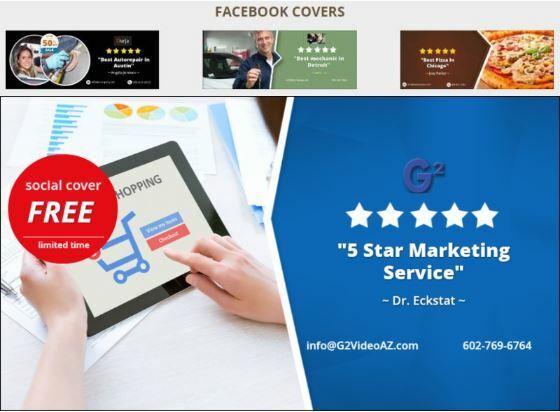 These videos showcase your 5 Star Reviews / Testimonials and show viewers how people rate your company. They are used to help get even more customers and portray an amazing image of your company. Statistically 35% of people that see your Groupon deal visit your website. To take advantage, you should create an ad on your site and retarget website visitors with other offers and not have to split it with Groupon. Get your FREE $500 Banner Ad and learn about Retarteting. In leading with value, we are giving away a FREE social cover as a BETA test of our new service- Social Covers (for Facebook, Twitter, LinkedIn, YouTube, Google+). We are expanding our Business Builder System to include Social Covers…you know the large banners at the top of social media sites… the ones that take up 50% of the page and are under-utilized for marketing messages…to engage your followers and get even more customers. We realize that each Social Media site becomes a digital store front for every business. So we came up with a great solution. P.S. LinkedIn is making significant changes in the dimension for the background/header/cover/hero image. So you need a new one…get it here. I feel like I possess a “secret super-power” knowing G2. Greg G is both leading the charge and watching my back when taking on any conceivable internet marketing, web-trend, web video, IT promotional synergy or social media challenge. From emerging technologies to traditional solutions, G2 is nothing less than spectacularly effective and Greg has really been a marvelous asset to my clients and myself. THANKS AGAIN GREG! Christopher A.
whiteboard/animation. Or the hot new Review Video that combines online reviews with video. SEO is crucial especially YouTube channel optimization if you want to get the most of search results. Lead conversion – Lead capture combined with structured email follow-up system. Constant Contact but also work with other solutions. You are 53 times more likely to appear on Google Page 1 if you have a video on your website. compared to site which don’t. YouTube is arguably the second largest search engine on the Web. It is the third most visited site on the Web. and another 31% are planning to. Meeting with client to assess needs and outline solution. Use vast array of resources to create video that is approved by client. Experienced and proven Marketing strategies using high-tech Video Marketing techniques to achieve measurable results. Our mission is to help business owners get more value more from their internet presence using Video Marketing. We’ve spent years and countless amounts of time and energy studying and executing video marketing. Now you can benefit from our efforts and have success. We work with all kinds of clients from people just getting started to seasoned veterans. We love working with Internet Marketing consultants to bring video marketing expertise to their clients. As you can imagine, turn around time varies by project complexity. Smaller projects like animations and trailer videos can be done as quickly as a day. Larger filming / editing projects are given a timeline after the scope of work is finalized. Still, we work in and efficient manner to deliver a high quality product in the shortest time frame. Click Here to see what Wikipedia has to say about Video Marketing. To support foster and indigent families at times of crisis or need by providing to them basic essentials such as bedding, clothes, personal effects, holiday and special occasion toys, school supplies and emergency assistance. We also act as a resource helping to connect families to other community based services including foster care enrichment and support providers.